When it comes to projecting an image, the warmth of real wood and veneer provides versatility to any interior environment. The natural material adds color, texture, and visual interest to business interiors where such things are often lacking. Some of our wood literature displays feature solid wooden construction over the entire fixture, while others offer just a touch that's visible on the edge of a wall mount rack or side of a brochure pocket. Naturally, wood is eminently attractive to almost everyone because it looks and feels good. 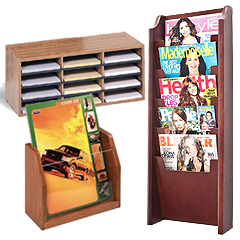 Our line of wood literature displays predominantly comes in three types of finishes: light oak, medium oak, and dark red mahogany. 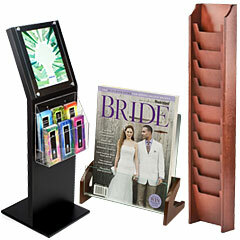 Also available are solid-core brochure and magazine stands with black or woodlike plastic laminate. 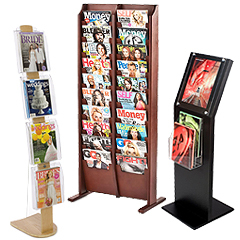 When choosing a holder or stand, you need to ask yourself "what kind of brochures, magazines, or pamphlets am I going to offer?" 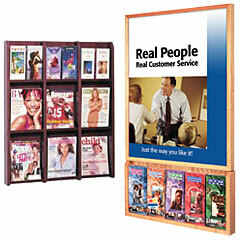 We sell racks and pockets with fixed sizes for displaying one type of leaflet or periodical. 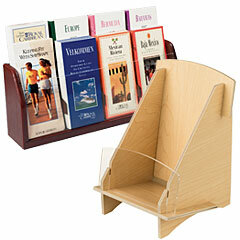 Perhaps more importantly, we also stock wood literature displays with adjustable pockets. 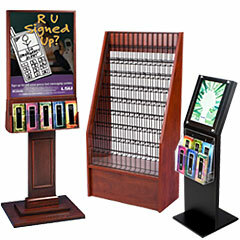 This means you have the capability to insert magazines alongside folded brochures within the same fixture. This customization provides excellent flexibility for your business, office, or waiting room, and comes with specific models in each style: tabletop, wall, and free-standing. Click on one of the categories above to discover what we have to offer.